Try the new Heavy Duty Transparent Spoons in the US market. You won’t find these spoons anywhere else. *Mix Colors will change randomly according to availability. 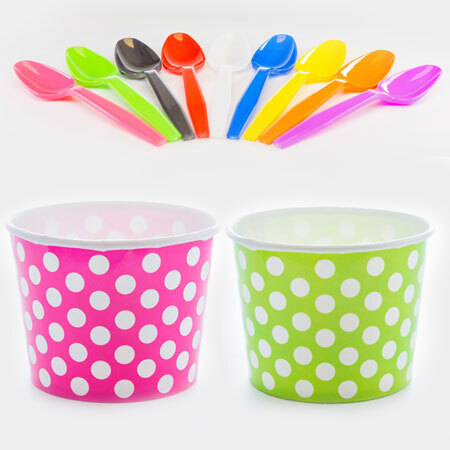 Froyo Gelato Supplies offers a variety of Ice Cream Supplies and Frozen Yogurt supplies to choose from. We have everything from Spoons, Cups, Containers, Straws and more. If you are opening up an Ice Cream or Gelato store than you’ll love our wholesale pricing and Free Shipping on all frozen dessert supplies. See why businesses everywhere choose Froyo Gelato Supplies for all of their needs. Multiple payment options to choose from.